Theft, vandalism, attacks on staff – these are just some of the ways in which your shop’s security could be compromised. While you may not want to think about such scenarios, as a shop owner it can pay to be alert to these possibilities. The total direct cost of retail crime was £700m in the period between 1 April 2016 and 31 March 2017. This is according to the annual Retail Crime Survey published by the British Retail Consortium (BRC). So what are the options available to you as a small retail business owner? In this article we’ll provide more information about business security systems for shops in particular. What are shop security systems? You can go straight to the section you want to learn about the most by clicking on the links above. Or, read the article from start to finish for a more detailed look into shop security systems. Alternatively, if you’re ready to compare quotes for business security now, fill in the form at the top of the page. A retail security system is a way of protecting your goods, your team members and your shop. It’s used to catch intruders and thieves, as well as to deter them from entering or stealing in the first place. Retail security systems can be scaled depending on the size of the business. For example, the security requirements of one small shop with one entry point and cash desk, in comparison to that of a department store with multiple entrances, levels and pay points, are likely to be considerably different. There were more than 950,000 estimated incidents of theft in the last year – an increase from 575,000 in the previous year, according to the Association of Convenience Stores (ACS) 2018 Crime Report. If you use a professional security company, they may also offer a monitoring service, meaning they survey your alarms and cameras and can alert you, as well as the relevant authorities (e.g. emergency services) if a break-in should occur. One of the main problems facing retail business owners is shoplifting – therefore, security cameras offer a way to monitor your shop floor, and alarms can alert you if a theft has occurred. A security company can assess your shop’s specific needs. Camera and alarm systems that you can self-install and monitor yourself are possible – often you can use an app to connect them to a smartphone and alerts can be sent to your device. If you own a shop and live above it, then you should consider how each premises need to be protected individually. When creating a security strategy, consider both risks from inside and outside of your shop. Arson, robbery and shoplifting are examples of risks from outside of your shop. Risks that may come from staff and other people that may have access to your business, such as suppliers or contractors, are risks from inside your shop. To help with this, you can use access control to limit movement on your premises. Think about the design of the system too – do you want it to stand out or blend into the surroundings? This is likely to depend on the design and branding of your shop. When deciding how to secure and protect your shop, there are essentially two options: use a specialist security company (some may even specialise in retail services in particular), or install and monitor the system yourself. Remember to train staff in the security procedures. A security company may offer this if you use this service, or you can look at alternative ways of training your team if you set up and monitor the security system yourself. The fitting rooms in clothes stores can be particularly vulnerable to shoplifting. You can have a member of staff dedicated to monitoring this area, and use tags on clothes, to help prevent and minimise theft from occurring. Pedestal systems are the alarmed barriers near the door that can detect security tags or labels. They’re activated if someone passes through without having had it scanned and deactivated at the till – this can suggest theft, but it can also be a false alarm too. Door security systems like this can be visible, or they can be concealed within the entryway. There are a number of different type of tags, including hard tags and labels, as well as alarmed and ink-based devices. With the latter, ink is spilled if the tag is attempted to be removed without proper equipment. Detachers have to be used to remove the tags. Some work with both label and tag systems, while others may only work with either. Labels use different frequencies to raise the alarm. They may be fitted with specialist devices so that different sounds or alerts can be heard for stock that’s placed too near to the barriers, such as window displays. To use this type of system, you need security tags or labels on stock, in addition to the barriers. You should also consider a retail store alarm system to protect your shop when it’s unoccupied, such as outside of trading hours, overnight, or if you go overseas. These systems use detectors and sensors to alert you (or the monitoring company) to a potential break-in or intruder. Intruder alarms work by a series of sensors in a space that are connected to a central control panel. The panel is where the alarm can be activated and deactivated, either by entering a code or swiping a physical fob. The costs of fitting an alarm into your retail business will vary depending on the size of your shop and the complexity of its security requirements. Learn more about intruder alarms and alarm system costs. Another common security method is to use retail CCTV security systems. You should consider the type of cameras and where they would need to be placed e.g. high traffic areas like entrances, or near the till. It’s also possible to self-install cameras – there are specially made kits, for example. Wireless cameras tend to be more easy to self-install and offer more covert surveillance, as well as no need to worry about the safety of cables and wires on your premises. In contrast, wired cameras need to be connected and fixed into place, and suit businesses looking for a strong security presence, as well as those that may not have the strong internet connection that wireless cameras require. You may be able to access the recordings remotely to view from wherever you are, so even if you’re not at your shop, you can see what is happening. It may be possible to use the recordings during an investigation, if needed. If you use a professional company to install and monitor the cameras, then an analytics service may also be available. It collects data that can help you to track and monitor footfall and activity in your shop. This is usually more suitable for larger premises or multi-site operations. Analytics can produce heat maps, or tell you where the direction of traffic in-store is going, for example. It could be used to support retail shop security systems. 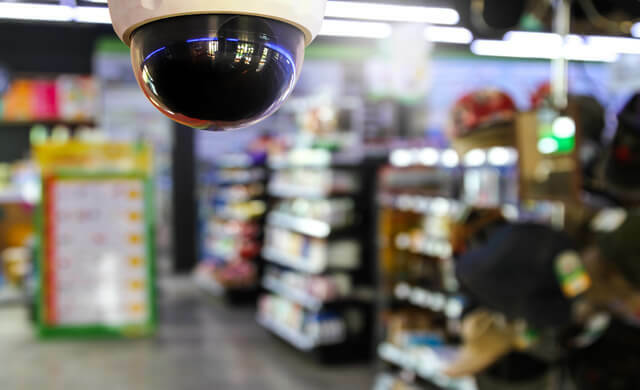 If you’re interested in using CCTV cameras for retail shops, read our pages on CCTV cameras and security monitoring for more information. You should also consider securing entry and exit points with security doors and locks. This could be to restrict access to the stockroom, as well as areas that are off the shopfloor and not open to the public. Fire alarms are another important aspect of protecting your business and team members. If your shop carries high value or luxury goods, you may want to consider security fog. Whichever type of retail security system you use, consider how it will be maintained and serviced. At this stage, you’ve learned more about shop security systems, including what they are and how they work, as well as the different options for creating a system that’s right for your business requirements. Plus, we’ve looked at some of the potential benefits of securing your shop. For more detailed information relating specifically to your small business, complete the form at the top of the page to compare quotes for business security now.